I still recall that movements and enjoy. Lets read her story . When Nadia was about 14 she scored the first perfect 10 at the Olympics in Women's Gymnastics. She was only 86 pounds and 4 feet 11 inches. That's about the size of a really tall 4th grader! No person, especially such a small one, had ever scored a perfect 10! Nadia Comaneci was born to Gheorge and Stefania-Alexandria Comaneci on November 12, 1961 in Onesti, a factory town in the mountains of Romania. Nadia and her family lived in a small apartment. She was an active child who enjoyed running and jumping. In fact, her love of jumping broke four of her family's couches when the springs snapped. One day, the gymnastics coach of an Onesti sports school, Bela Karolyi, visited Nadia's school. Noticing Nadia and another girl pretending to be gymnasts, he started to go over to talk to them. Suddenly, recess ended and he lost the girls, for they rushed away quickly and disappeared into the school. Bela decided he would not leave until he found the two girls. He went class to class asking for gymnastics-lovers. In the third room he visited, two girls immediately squealed, "We do, we do!" Bela was glad he found his two girls. Nadia was taken to Bela's gym to take a test. Any child who wished to train with him must pass this test. She was asked to do a long jump, a 15 meter sprint, and walk on the balance beam. There was not a more important part than the balance beam. The children were sent home if they were scared of the beam. It was 4 feet above the floor and only 4 inches wide. Nadia wasn't scared at all. She walked across it like it was the sidewalk. She passed the test with flying colors. Nadia's parents agreed to let their young 6-year-old daughter train at Bela's gym. Bela described Nadia as the perfect pupil. "She knew no fear." Nadia trained 6 days a week and 4 hours each day. The only day she didn't train was Sunday. Nadia was the first to arrive in the morning and start warming up for her workout. She would practice exercises again and again (and again one more time) without a single complaint and she never seemed to get tired. After only one year, Nadia was ready to start competing. She entered the Romanian National Junior Gymnastics Championships. She was the youngest gymnast and she still placed 13th. This was pretty good for a 7-year-old. However, Bela knew this was not her best. For good luck, he gave her a little doll and told her "never to finish thirteenth again." Bela didn't know he was starting Nadia's doll collection, and of course, she never placed 13th again. She returned to the National Junior Championships a year later (with Bela's doll) and won first place. She was only 8 years old. 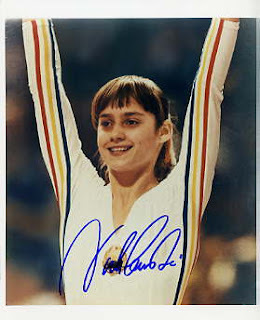 In 1971 Nadia became a member of the Romanian Gymnastics Team, she also won the national overall gymnastics title for her age group. That year she also traveled to Bulgaria to compete in the Friendship Cup Meet. She had never competed with anyone but Romanian gymnasts before. This time, however, it was different. She won two gold medals. And she also bought some Bulgarian dolls for her collection. The next year, 1972, she won the National Junior Championships for the 3rd time and collected 3 more gold medals from the Friendship Cup Meet. In 1975, at about age 13, Nadia was old enough to compete as a senior. She won one silver and four gold medals at the European Championships. One of the gold medals was for the all-round competition. Nadia was the youngest girl to have ever won it. She was ready for the big one now. Ever since first began gymnastics, Nadia had dreamed of competing in the Olympics. In 1976, at age 14, she got her big chance. The Olympics were taking place in Montreal, Canada. The first event was Nadia's favorite, the uneven parallel bars. She went forward with such force that it absolutely dazzled the awed judges. One announcer said she looked as if she was "swimming in an ocean of air". The audience was quiet, waiting for her score. Suddenly, the scoreboard lit up with a 1.00. No one understood how this wonderfully talented little girl could have scored only a tenth of a point. All of a sudden all made sense. No one ever scored a perfect 10 before and the scoreboard didn't have enough room! The crowd went wild. She went on to score 7 more perfect 10's and went home with 3 gold medals, and one each of silver and bronze. In 1976 she was awarded the Hero of Socialist Labor because of her terrific performance at the Olympics. It was the highest honor in Romania, and she was the youngest ever woman to receive it. 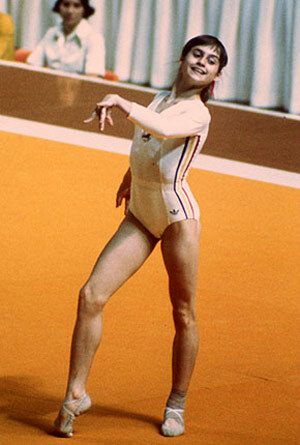 She went back to the Olympics in Moscow, 1980 and won 2 each of silver and gold. A year later, Bela and his wife Marta defected from Romania. Nadia started thinking about moving to another country too. The Romanian government kept close eye on their prized gymnast, fearing she too would defect. Now she could no longer travel outside to judge international competitions. In 1984 Nadia returned to the Olympics as a coach of the Romanian gymnastics team. In 1989 she defected from Romania in the dead of night, leaving behind her precious medals, her mother, her father, and her little brother, Adrian. In 1994 Nadia donated $120,000 to the Romanian gymnastics team. In 1996 she married Bart Conners, another Olympic champion. They now live in Norman, Oklahoma and run a gymnastics school. As her legendary coach, Bela Karolyi once stated of Nadia, "She has three qualities. The physical qualities-strength, speed, agility. The intellectual qualities-intelligence and the power to concentrate. And above everything, Nadia has courage."